In a season when Mark McGwire pummeled pitchers with his home run power, Bob Tewksbury used lollipop pitches to keep the Cardinals slugger from hitting the ball out of the infield. In 1998, Tewksbury, the former Cardinal, was with the Twins in what would be the last of his 13 major-league seasons. McGwire was in his first full year with the Cardinals and headed toward a record-breaking season in which he would hit 70 home runs. 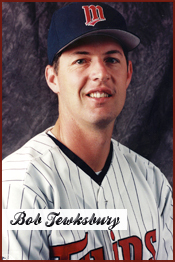 On June 28, 1998, Tewksbury got the start against the Cardinals at the Hubert H. Humphrey Metrodome in Minneapolis. McGwire entered the game with 36 home runs and a .313 batting average. When McGwire came to bat in the first inning, Tewksbury lobbed a pitch toward the plate. McGwire watched it float out of the strike zone for ball one. Tewksbury followed with another lob, a pitch accurately described by Dan Barreiro of the Minneapolis Star Tribune as a lollipop. Rather than give it a lick, McGwire swung and dribbled a grounder to first base. As he headed toward the dugout, McGwire shared a laugh with first-base coach Dave McKay, the Associated Press reported. When McGwire came to bat again, in the fourth, Tewksbury got two quick strikes on the slugger before he floated the lob pitch. McGwire swung and popped out near first base. When Ray Lankford came up in the same inning, Tewksbury delivered two lobs. Lankford watched one and grounded out on the other, ending the inning.